I love road trips. I’ve loved them since I was a kid, when my family would drive from New Jersey to Florida each summer in our trusty station wagon, all four kids plus the dog in tow. My dad liked to leave really, really early in the morning (or really, really late at night, depending on your perspective). He would come home from work and go straight to bed, and then around three or four in the morning, he and my mom would carry us out, still asleep, and we would hit the road in the pitch darkness. As glamorous as they seemed at the time, these pre-dawn departures were entirely practical: When you’re driving 1,300 miles with four kids and a dog, you want to minimize the hours that everyone is awake at the same time. My parents simply wanted to enjoy the first five or six hours on the road in peace. Dad would drive with his window open, left elbow propped on the windowsill, air conditioner on full blast. (We kids were quite a sight at gas stations, spilling out of the car all bundled up in sweatshirts and winter socks, soaking up the heat to thaw before getting back in the icebox that was our station wagon.) By the time we reached Florida, my dad’s left arm was as dark as the rest of us would be two weeks later. Along the way, we ate pre-made sandwiches, poked at each other, napped on and off, fought over the rear-facing seat in the back, and asked, “How much longer?” By 4 p.m. on day one, we were in the pool at a roadside motel somewhere in the Carolinas. Day two brought more of the same fun: on the road by 4, snoozing and poking and freezing and fighting, until that moment when we spotted the Coppertone billboard from the highway. 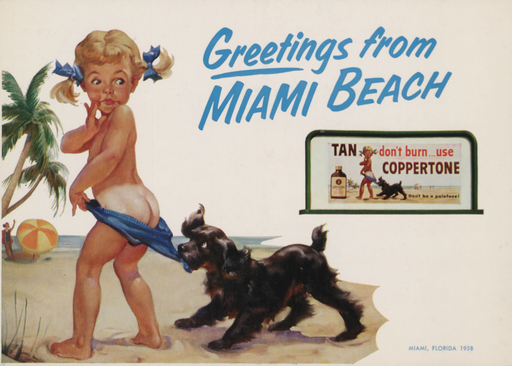 That iconic image of a dog pulling on the swimsuit of a pig-tailed toddler could mean only one thing: we had finally reached Miami, our ultimate destination. The iconic Coppertone billboard let us know we had reached our final destination. Maybe it’s the nostalgia, but even as a grown-up, my favorite vacations have been road trips: 10 days driving around New Zealand with a girlfriend… venturing across the Colorado Rockies in a convertible Mustang with my cousin, Thelma and Louise-style (minus the crime spree, Brad Pitt encounter or tragic ending)… navigating the often treacherous roads of Costa Rica with my husband on our honeymoon… and most recently, striking out on the autobahn to tour Germany with my husband and step-daughter to celebrate our milestone birthdays. In preparation for each of those trips, I studied maps, researched destinations and attractions, created detailed itineraries, mapped out routes, and calculated drive times. I invested hours and hours up front to ensure that not a minute would be wasted along the way. This intense planning process also served to build my excitement and anticipation as each departure date neared. And then there was the road trip that never was: the post-college cross-country trek with my high school bestie. I don’t remember when the idea first sprouted, but I do remember researching camper vans, creating a budget, and mapping the hometowns of college friends who might host us along the way. I had just started to plan our itinerary in a notebook I bought just for the trip when I got the call: she was engaged. And just like that, the trip was quashed. Twenty-eight years later, we both know he wasn’t worth it. But everything happens for a reason, right? And my dream of driving cross-country at a leisurely pace, to explore this huge and fascinating country with my best friend, is far from dead. I’m pretty sure I still have that notebook stashed away somewhere… time to dig it out, I think. Do you love road trips? What do you love about them? And where will you go on your next one? Please share! « The Future Is Here, Dammit! WOW… how true. Only when you get to that point will you fully understand and appreciate how true it is….. when we leavin’????? ?